Have you been watching the excitement from Sochi? As I type this my husband is sitting in his chair watching a curling match between China and Great Britain so I can hear the cheers of the crowd. Mostly we've been watching curling, but we've seen a little of some other sports too. My favourite Olympic sport isn't a winter one, though. I competed for about seven years as a rhythmic gymnast, so when the summer Olympics are on I watch as much of the rythmics competition as I can. I never came anywhere near even the national level of competition, but I remember the hours of practice, the feel of the equipment in my hands and the nervous thrill on the day of competition. Watching the team competition during the Beijing Olympics I was struck by how often the equipment changes hands. Click to see the group routines from China, Spain, and Belarus. These teams consist of 5 women, each with either a hoop or a pair of clubs. As they danced, leaped and spun, each gymnast released her hoop or clubs and kept moving. She hoped her teammate would be in place to catch the equipment, but she couldn't stop to watch and make sure. The beauty of the performance came as one woman released her hoop into the air, turned and leaped to a new position to catch a pair of clubs she didn't throw. 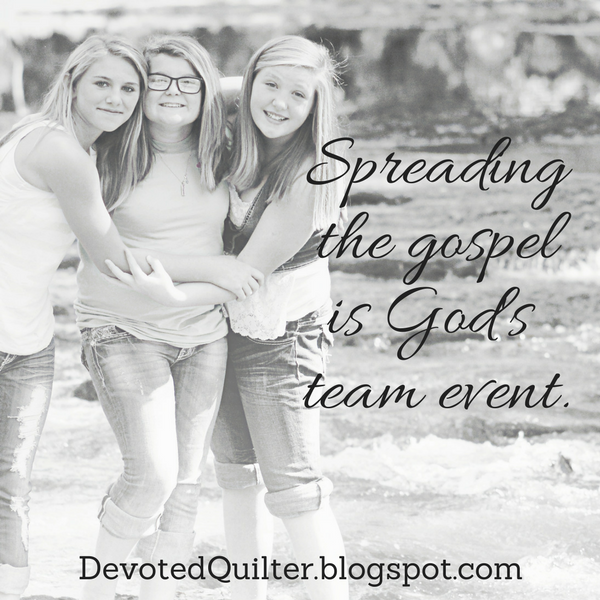 Spreading the gospel is God's team event. Reaching even one person takes the work of many. I became a believer through the work of three international radio ministries and one small Newfoundland radio station. I will never meet most of them, but they all played a part. The person recording the message was just as important as the speaker: if the recording were garbled or damaged, how could I have heard the message? Writing to the Corinthians, Paul acknowledged that he didn't do all of God's work himself: "I planted the seed, Apollos watered it, but God made it grow. So neither he who plants nor he who waters is anything, but only God, who makes things grow. The man who plants and the man who waters have one purpose, and each will be rewarded according to his own labor"(1 Corinthians 3:6-8). He also said, "By the grace God has given me, I laid a foundation as an expert builder, and someone else is building on it"(1 Corinthians 3:10). If Paul could not do everything himself, then we are free to admit it as well. Of course, we're not off the hook. Helen Keller said, "I am only one, but still I am one. I cannot do everything, but still I can do something; and because I cannot do everything, I will not refuse to do something that I can do." We each have a role to play in God's kingdom. One gymnast alone cannot compete in the team event, but neither can the team win if one woman stands still, refusing to do her part. God has given each of us different talents and skills for the work of spreading the gospel. If I don't do my part, something will be missing; if you don't do yours, something different will be missing. You may think you don't have any skills or that they aren't important. If so, I urge you to read 1 Corinthians 12:12-30. Each of us, as part of the church, is an integral part of God's design. In fact, we each have many jobs. My foot not only allows me to stand upright, but also to walk, to jump and to feel sand between my toes. Each gymnast is adept at dancing, leaping, throwing and catching. All these elements woven together form her unique routine which melds perfectly with those of her teammates to create an amazing team performance. I am a wife, mother, daughter, friend, quilter, writer and more. All these roles make up my life, my unique contribution to God's plan. Your life touches many people mine never will. As God melds my life with yours, and every other believer's life, He is creating His team -His church-and Jesus Himself said "...and the gates of hell shall not prevail against it"(Matthew 16:18 KJV). It is up to us to step up and do our part, fulfilling our role on the team as only we can.